Rear-facing for infants from 4-35 lbs. and up to 32″. Click Connect technology offers a one-step secure attachment to any Graco Click Connect stroller – create your own custom built travel system! Having a new baby and shopping for car seats I found to be exciting but also overwhelming. 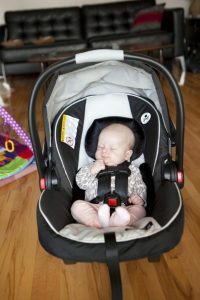 I recently had the opportunity to test out the Graco snugRide click connect 35, I was impressed by the many features including its sturdiness, stylish look, easy to clean and affordability. But what stood out right away was how lightweight and easy the seat was to use. This being my second baby I have struggled in the past with car seats that were very heavy, even before I put the baby in.This was a nice surprise. I like that I could adjust the harness straps from the front. The carriers that adjust from the rear are just not practical. It is never fun to have your baby happily sitting in their car seat, just to have to take them out because the straps were to loose or tight. Installing the car seat into the car was also easy to learn and do. The seat has an adjustable base that includes 6 positions. All I had to do was turn the dial! Other options for installing includes a lock-off on base for when your using a seat belt or the seat can be installed without the base. all very convenient. I love the click connect technology, making the seat compatible with many strollers. It was easy to disconnect the car seat from the base and transfer to my stroller, In fact like many other car seats, I did not have to tilt the seat as I disconnected from the base. Simple! Overall I would recommend this car seat to anyone who has a preemie, newborn, infant or toddler between 4-35lbs that is looking for a Mommy friendly and comfortable car seat that keeps their baby safe and cozy! Like Graco Baby Canada on Facebook to see more great products!